Jaymee’s Story – told by mum, Michelle. Jaymee was born on 17th May 1998. A healthy baby girl whom her brother wanted so much. When she was about 10 months old, her left eye started turning outwards and had an abnormal white reflection in it. We, as parents, did not see the white reflection until many months later. I regularly took Jaymee to the Health Nurse to have her weight and height checked. At the next visit I asked her opinion about Jaymee’s eye. She could see an abnormal reflection and the eye turning. Jaymee was referred to the GP and on to the ophthalmologist who checked her and said he could see something. He referred us to the hospital for more testing, and opinions from other doctors. This all took place within a couple of days. 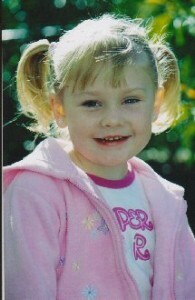 On Monday 8th March 1999, we arrived at the hospital for lots of tests and many doctors looking at Jaymee. By the end of the afternoon we knew the diagnosis: bilateral retinoblastoma – cancer in both eyes. Our questions then started: How do you fix it? How long does she have to live? What do we do? What did we do wrong to cause this? Why? The tests continued for days: blood tests, MRI, CT Scans. You name it, they did it. Unsure on treatment, they sent us to Sydney, for another opinion. The plan was 6 months of chemo and see where we go from there. A scary thought, but what do you do except be guided by the doctors? Explaining this to Zakk (Jaymee’s older brother) who at the time was only 3, was the hardest thing. The sadness in his eyes broke both Darren and myself, but thank God we had family who would look after him. He attended almost every trip of chemo and never complained – he just wanted to be there for his baby sister. We were always told there were no guarantees! We were told they would preserve life rather than sight. Over the next six months on chemo we studied a lot of material from the internet and books, and listened to, and asked lots of questions of the doctors, in the long run, this has helped us understand a lot more and has made us stronger people. The chemo was working – the tumours had shrunk by 70%. Doctors were very pleased with the result. We might be winning the battle against this, until we were hit with the news there were more tumours. So more chemo, and with this lot they did laser as well. Again, good results. We went on like this until Jaymee was almost 2 years old. In November 2001, Jaymee relapsed again in the left eye. The list of options was diminishing now. The suggestion was a radiation plaque over the tumour, so we did that – again with great results. Then her eye had haemorrhaged and the retina lifted…we knew straight away that was it. An emotional roller coaster, our world tumbled around us. After reading and studying all we had, we did not need to be told the treatment now. We knew they would have to take the eye. Still it was devastating to us, we put so much into this but, looking back now, we know we did all we could. The surgery was set for March 2nd. Zakk had just started grade 1. The hardest thing was signing the consent form for the procedure, even though we trusted the doctor fully. The question after the surgery was had we done the right thing? Jaymee did not take it well – she was an emotional wreck. As a mum I felt she was not complete without her eye, but after seeing her following surgery, emotions were easing, and once she got her artificial eye, we all felt at ease with everything. We continued to have regular eye exams and MRIs. Jaymee relapsed again in the right eye in January 2003, but it was kept under control with laser. Our life kept going on, and we thought what more could go wrong. Then in August 2003, the MRI picked something up and doctors were unsure. An emergency eye exam showed another relapse, but it was worse this time, and our world fell apart. The doctors discussed Jaymee’s case with the world’s best retinoblastoma specialists, and decided she would be better off in Canada, receiving treatment offered there. Jaymee’s eyesight at this stage was still very good. So we fundraised to get to Canada. We arrived in Toronto to find the tumours were a lot worse than we thought, and were told the treatment may not work, but we begged them to try as the only alternative was to remove Jaymee’s eye. So we tried 3 rounds of chemo. The protocol was different from what we had done in Australia, but we were willing to give anything a go. During 10 months in Canada we learned a lot more about retinoblastoma and met many wonderful people who have the same condition. Jaymee’s remaining eye and sight have been saved, thanks to this amazing opportunity and many generous people. Today life is good, but you never know what tomorrow brings. We still fear cancer will again threaten Jaymee, but hope and pray every day that she stays cancer free…that we have won this battle for life. Together, our family has been through a lot, but you are given no option when you are dealt something you cannot fix yourself, and it is taken out of your hands. Jaymee and Zakk are still like two peas in a pod and share a special bond. Life for our family is good. We take one day at a time and say “never say never”, because anything can happen.